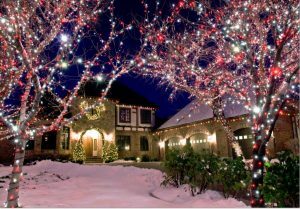 Your Holiday Lights® specializes in holiday light design, installation,take-down and storage. We are locally owned and operated by your trusted home service providers, Window Genie. Together, you and our team at Your Holiday Lights® will bring your vision to life! Our fully trained, insured and bonded field technicians are experienced professionals ready to transform your home Christmas lights for the holiday season. For a free consultation and to discuss your home’s Christmas lights design concept, call (888) 321-8882 or CLICK HERE to schedule an estimate. We look forward to brightening your home this holiday season, and for many to come. Why Choose Your Holiday Lights®? As the nations leader in home holiday light installation, Your Holiday Lights® sets the standard in quality products, professionalism, and customer service. We offer a three year, no worries warranty on all maintenance and storage of your lights.